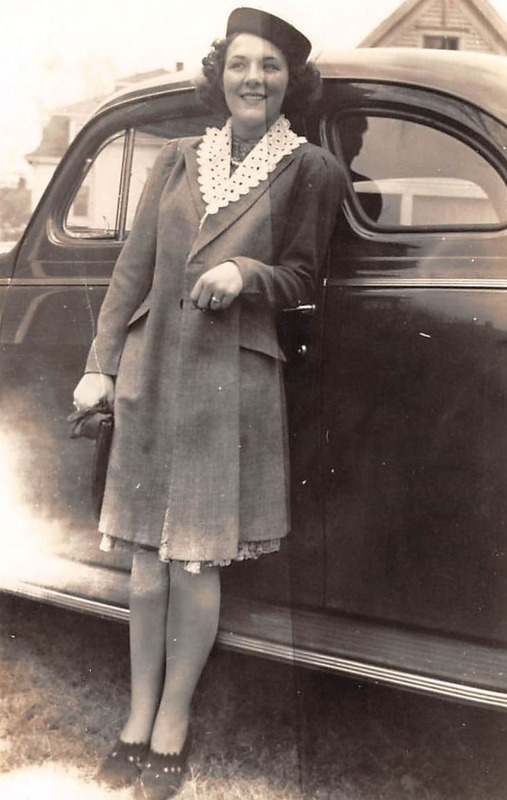 Beatrice “Bea” Weber was born on February 12, 1903 in Chicago to Francis Moran and Sarah O’Toole. Both Francis and Sarah were born in Dublin, Ireland, where Francis worked as a butcher and Sarah stayed home and cared for their two sons, Herman and Daniel. When Daniel was just a baby, Francis and Sarah decided to immigrate to America, hoping for a better life. They made their way to Chicago and settled in an apartment on Halsted on the south side and there had two more children, Bea and Nellie. Bea attended elementary school and was apparently very athletic. She loved to swim and also loved to play basketball, which was unusual for a girl at the time. When she graduated from eighth grade, she got a job at Andies Candies, where she worked at for a couple of years before getting a job as a bank clerk at Citizens State Bank, a job she kept until she retired at age sixty-eight. At some point, she met a young man by the name of Peter Weber, who had also been born in Chicago, though his parents had emigrated from Germany. Peter worked as a sales rep for Phillips 66. After they were married, they got an apartment on the north side on Glenwood, but moved to various apartments around the city and Park Ridge until they eventually bought a house on Pratt Avenue. Unfortunately, Bea and Peter never had any children, so they both continued working and joined many clubs and organizations, such as the Elks and the Rotary, and were on various bowling leagues for many years. Bea even convinced Peter to join the couples softball team at Citizens Bank, though he was reluctant to do so, not being as fond of sports as Bea was. They also traveled often, especially with Peter’s job, and visited almost every state in the country, including Puerto Rico. Apparently, Peter was a very kind, subservient man with a very nervous disposition. He developed peptic ulcers and then was diagnosed with prostate cancer and some sort of blood condition. He died eventually of pneumonia in 1984. Following Peter’s death, Bea lived alone for many years in the house on Pratt Avenue. As Bea aged, she became less and less social and more and more dependent on her nephew, Lou, and his wife, Mary. Lou was Bea’s sister, Nellie’s, only son, and Bea always had a soft spot for him, especially as she never had children of her own. At first, Lou says, he and Mary were happy to help out, stopping over a couple of times a week to clean or to take her out for errands, but when Bea began to repeatedly call them in the middle of the night for various reasons, it started to become a strain. The first time Bea called them in the middle of the night, it was wintertime. Bea telephoned Lou, crying, saying that her gas and electricity were off and could they come over and help her, as she was very cold. Lou and Mary rushed over, only to find Bea sitting in the kitchen, waiting for them with a pot of coffee made, the gas and electricity working perfectly. Her explanation to them was that the electricity had miraculously come back on just before they had arrived. Lou says that his Aunt Bea “pulled this stunt,” or similar ones, many times. Eventually, Lou and Mary became less willing to dash over and “rescue” Bea from false alarms, so Bea apparently started disconnecting everything herself. In the summer months, this would cause the food in the fridge to go bad, which was infuriating to Lou and Mary, on top of everything else, because they were the ones that had gotten the groceries for her and paid for them! Even so, they warned Bea that if the power was off—for whatever reason—that she should not eat any of the food in the fridge in case it had spoiled. Inevitably, however, when Bea would call to say that nothing in the apartment was working, causing them to reluctantly go over to reconnect everything, they would find Bea calmly sitting in the kitchen eating the spoiled food. “It was almost as if she did it to spite us,” Lou says, as any other time, she refused to eat anything that wasn’t a dessert. “She basically lived on sugar,” he says. wow…could have been her personality all the time..just was not noticible when her husband was alive…then..perhaps she was just lonely..then…she did fall into dementia…Sure hope I do not go this way!! I wondered the same thing, SueAnn. Her nephew seems to imply that this was always her personality, but who knows? I know what you mean, though, I hope I don’t suffer from dementia, either. What a sad fate… Thanks for reading and commenting! What a wonderful story. Are there any more photos of her? Thanks for reading, Damian! No, I sadly don’t have any other photos of her.